The Brambles Bag is an adorable, quick-to-make, clutch-style handbag. The Bramble Stitch pattern is a 4 row pattern with the 2nd and 4th rows being the same but offset. The stitch pattern creates a great textured fabric. The sample bag in the pattern uses one skein of Koigu Kersti Merino Crepe. 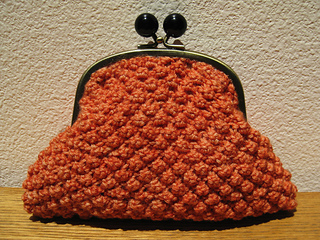 However, any DK weight yarn can be used to create the bag. 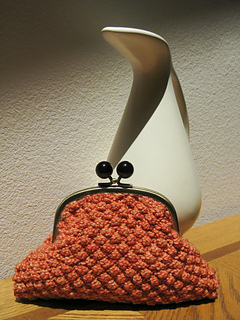 The handle is a Inazuma BK-1275 purse frame and the bag is lined with fabric. Kits to make this bag are available from www.foxyknits.com. The kit includes one skein of Kersti Merino Crêpe, the purse frame, fabric for lining and the pattern.